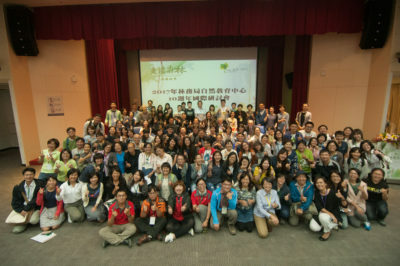 Senior Fellow Rick Zenn was invited to provide the closing keynote address at the 2017 Taiwan Forestry Bureau Nature Center 10th Anniversary Conference at the Taipei City Youth Development Center this past May. Zenn was introduced by Emeritus Professor Dr. Wang Xin from National Taiwan University and followed new TFB Director General Dr. Hwa-Ching Lin, formerly deputy director of the National Taiwan Museum and the Taipei Zoo, who outlined TFB’s impressive “Learn from Nature, Learn with Delight” initiative. Zenn spoke about the Oregon Forestry Literacy Plan and the work of the World Forestry Center. He also participated in the TFB Community Fair at the Taipei Peace Park and was a special guest at the Nature Center staff reunion. Many thanks to Dr. Chin-ying Lee of the Chinese Society for Environmental Education, Drs. Yi-Hsuan Hsu and Li-Hsin Weng, of the TFB leadership team, and Dr. Chou Ju of NTNU, among others for being great hosts and hard-working, inspirational colleagues.